So one of the truisms I often repeat is that the great irony of owning a comic book store is having less time to read comics. I mean, I’m doing my best, and it’s not like I get all that many to begin with, but trying to find the free time to sit down and read them is quite the challenge. Usually, the evening after the new shipment arrives, I’ll try to get through as many as I can from the batch I’ve taken home, but if I don’t get through them all…well, generally, the ones I don’t finish will just roll over to the next week and add to the next pile of new comics, and you can see how this can turn into a problem. Again, I don’t get all that many, but even falling behind on a couple series can build up the need-to-read stack faster than I’d care to see, especially with DC’s current biweekly schedule on a number of their titles. I am trying to put a little more effort into catching up, and I’m slowly doing so…and it’s not like there’s anything I’m particularly anxious to cut from my reading lists. I do like everything I’m reading at the moment, so there’s nothing that really stands out as being in need of a culling. And having this iPad and a Comixology account ain’t helping. You may be wondering what all this has to do with the picture of The Joker: The Clown Prince of Crime trade paperback in the corner of this post, there. That, my friends, is a scan of a trade paperback I actually acquired in late 2013, when I was still at my previous place of employment, and I never made the time to actually sit down and read. Yes, even when I was but a mere manager of a comic shop, and not the All-Mighty Lord and Master of My Own Funnybook Store, I was having difficulty keeping up on everything I wanted to read. Usually, the periodicals would come first, then I’d make my way into the collections like these…which of course meant the trade paperbacks and graphic novels would sometimes sit around a bit before I’d finally get around to them. As it turned out, I’ve been a little under the weather lately…feeling better today, but in case you were wondering why I didn’t update this site with a Monday post this week, that’s why. But as such I’ve been resting at home in the evenings, and doing a little comic book readin’, and this Joker TPB was amongst the materials I’ve been perusing. Now, it’s a fun series, and one I’d been intermittently acquiring in singles (which I’ll tell you more about in a moment), but never finished, so this book fit my collecting bill, or, you know, something like that. It’s a breezy read, with entertainingly funny stories by Denny O’Neil, Marty Pasko, and Elliot S! Maggin with art by Irv Novick and Jose Luis Garcia-Lopez. It even makes an attempt at some slight continuity, with a consistent supporting cast, or at least recurring characters (such as the henchman named “Southpaw”). Every story pretty much ends with the Joker’s defeat, naturally, since he is a villain, despite being the star of this show. 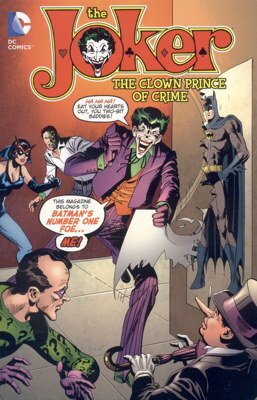 One weird aspect of reading this series comes from both the change in preferred storytelling techniques from then ’til now, and the change in the actual portrayal of the Joker. Back in the ’70s, when this series first appeared, thought balloons revealing a character’s internal monologue were still a thing (and would continue to be a thing until mostly falling out of favor in recent years). As such, in this comic we were occasionally privy to the Joker’s “private” thoughts…not that anything deep or meaningful was revealed, no hidden motives or secret pasts referenced, but we were still given a peek into just what was going on in that head of his. This had bit of a “normalizing” effect on him, from my perspective, especially when contrasted with his appearances in more modern comics as an unknowable, terrifying monster with no thought balloons. Or at least fewer…don’t have every recent Joker appearance right in front of me, but my memory is that, given the de-emphasis on thought balloons in comic book storytelling, we weren’t given the same insight, as it were, into Joker’s thoughts as we did back in this series and other comics at the time. Of course, adding to this contrast is that the older version of the Joker is more…well, “friendly” is almost certainly the wrong word, but was definitely more a cartoony, funny character who shocked you by also being a murderous clown, versus the modern Joker who from the get-go absolutely looks like he’s going to kill you and everyone you know. Not saying one version is better than the other, but it’s interesting to note the change. Selling black market beetles? Smuggling drugs via luna moths? Waiting for his moment to make his strike against the world? “RISE, MY POTATO BUG ARMY, RISE!” I love the idea of an entomologist just pretending to be a fine, upstanding insect scientist by day, while committing the most heinous of crimes at night. BUG CRIMES. Anyway, I’m glad I’ve finally got to read this book, after it had been sitting on shelf at home, unloved, all this time. Now, the first time I read an issue of this series, it was from buying a copy of #1 at one of the monthly comic book conventions in Los Angeles, sometime in the late 1980s. This was prior to the release of the first Tim Burton Batman movie, so sales and prices on Bat-stuff hadn’t yet gone completely crazy, which is why I was able to find a copy of The Joker #1 in someone’s dime box. No, not a dollar box, or even a quarter box, but a dime box. For a measly 10 cents, I got my hands on that first issue. As I recall, it was the only comic I bought from that particular dealer…making him give me change back from my dollar for this one lowly issue. No idea what other treasures I passed up there…probably stacks of Incredible Hulk #181 and Uncanny X-Men #137, but I had that Joker #1 and that was all I needed. And then the Tim Burton Batman movie came out and everyone lost their minds and I ended up eventually selling it for, like, $30, so there you go. Not long after the Burton film and the attendant Bat-price increases, when I was still just a fresh-faced young kid working at the comic book store, one of our regulars fished a copy of The Joker #1 out of our 50-cent boxes. Needless to say, this wasn’t a 50-cent comic any more at that point, but we played fair and sold it to him at that price, with both of us knowing what a deal he got. Naturally, after he left, we zipped through the bargain boxes to make sure no other “great deals” were to be found. And nope, just a bunch of DC’s 100-Page Giants from the 1970s…those were mostly all reprints, and nobody was ever going to pay big money for any of those, ever. You are a raw amateur, sir, at not reading things purchased. I have paperbacks on my shelves that I bought in 1976 and have not yet read. 40 years, man! “Crooked entomologist”! That kind of thinking is also at work aplenty in Michael Crichton’s film “Twister”. It cracks me up – the depiction of sinister meteorologists, driving around in identical black minivans. The way Bill Paxton spits out his dialogue how Jonas is only in it for the MMMMONEY. Twenty years later, I still can’t watch the evening news and not think to myself, “That weather man? I bet he’s only in it for the MMMONEY.” Now I know. 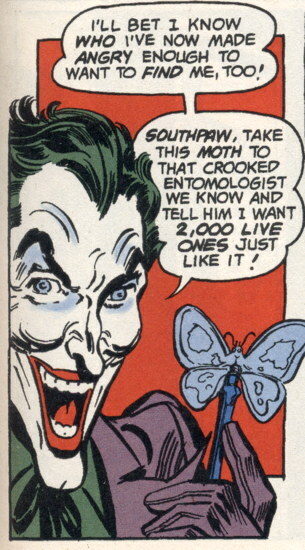 He’s as evil as an entomologist! So this crooked entomologist, was he from one of the Elliot S! Maggin stories? I seem to recall Luthor being familiar with a crooked philologist in one of his Superman novels. Have this collection, and a few single issues from the run as well. What a weird and fantastically wacky title! I also miss thought balloons, omniscient narration and other elements that made me take a half hour to read a single issue of most comics (longer if they were written by Roy Thomas) back in the day. One of the reasons I stopped reading comics 20 years ago was because content started getting skimpier while prices were going up. Perhaps entomology is a more corrupt enterprise than the public would guess.